Unknown variety gifted by RenewableCandy, no details given. 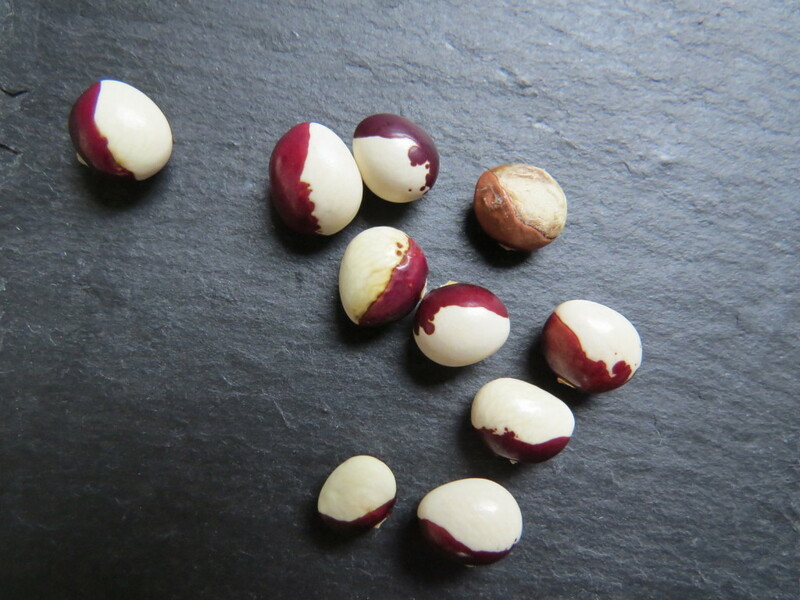 Calypso – A red/burgundy and white bean with beautiful striking markings. RenewableCandy says they are also known as Yin Yang and are a climber. Cara la Virgen de la Bañera Leon – Translates as Face of our Lady of Lion’s Bath. 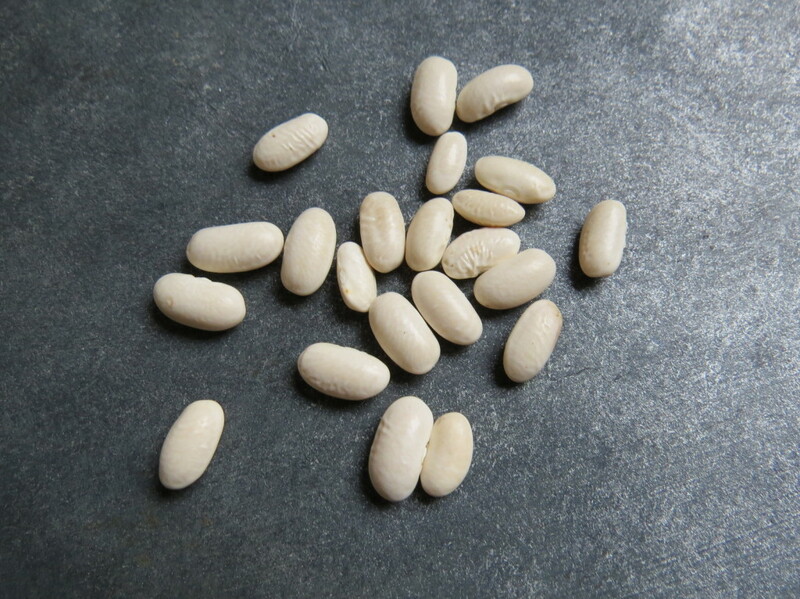 This Is a Spanish heirloom bean originally bought from a market in Majorca. It is dual use, stringless which makes for a lovely green bean. 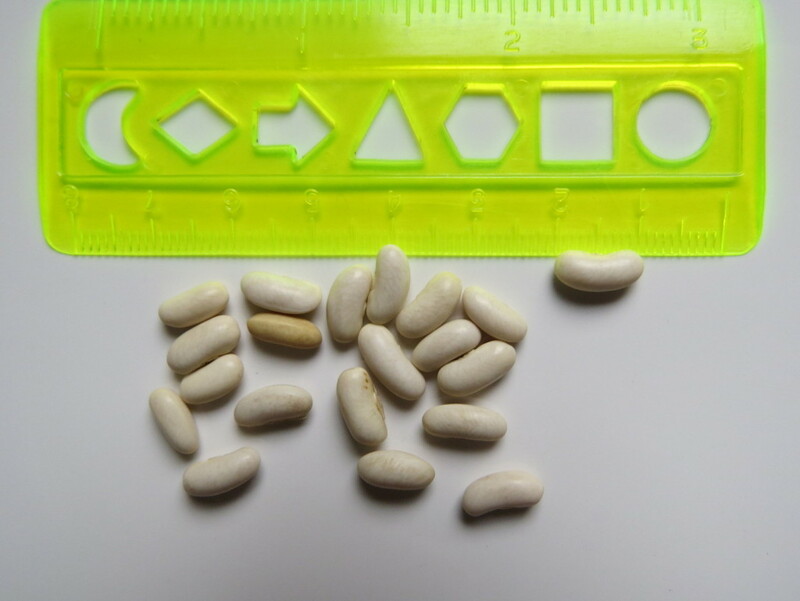 But also good as shelling bean, the nice plump beans inside are big and nutty. My donor was German seed saver Prof Klapprott. 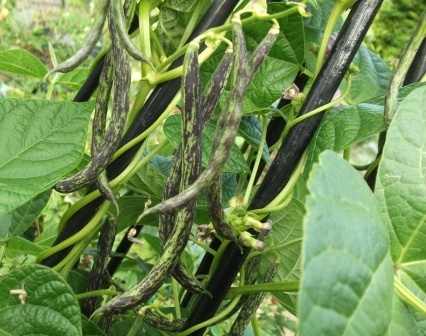 Cousin Oliver – This is a lovely climbing French bean which produces lots of beans in bunches. 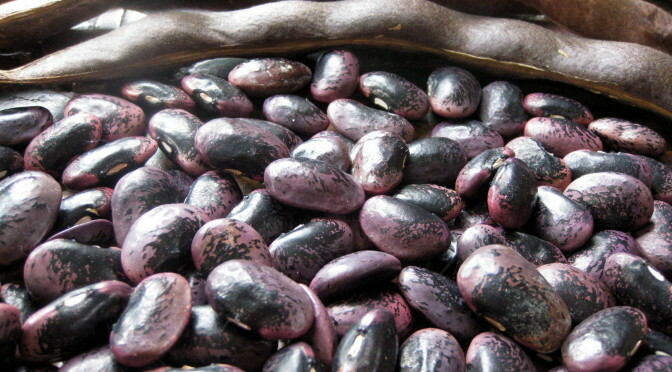 Every bunch has up to 7 medium sized beans, green with purple striping. They need stringing but make very tasty green beans. My source was my seed friend in Colorado, who swapped them with her friend Barbara Parker. It originally came to Barbara’s family from their cousin Oliver (hence the name) and has been grown by the Parker family for a long time. I have recently come across a discussion on a mainly US gardening group that speculates whether Cousin Oliver may be related to, or even identical with, the variety Rattlesnake, although my own Rattlesnake are a little different. 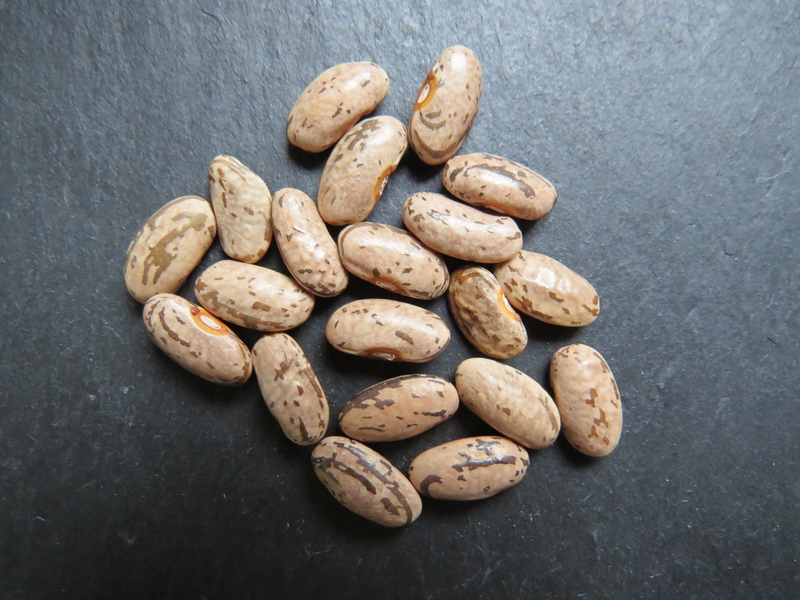 It makes no difference, these are a great bean variety which grows well in the UK. Cousin Oliver, crop of coloured pods. Picture Galina. 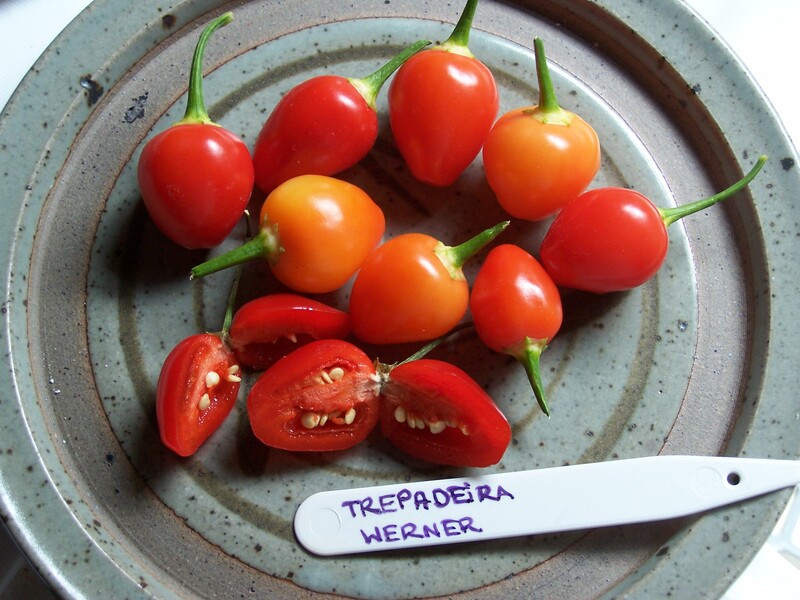 Ruud reports this variety came from a seed swap, with the seeds coming from America. He believes they are from a different source than Galina’s Mr Yeoman’s White seeded Cherokee Trail of Tears she shared with the 2013 group. Although it is not clear if they are another white seeded mutation of Cherokee Trail of Tears. 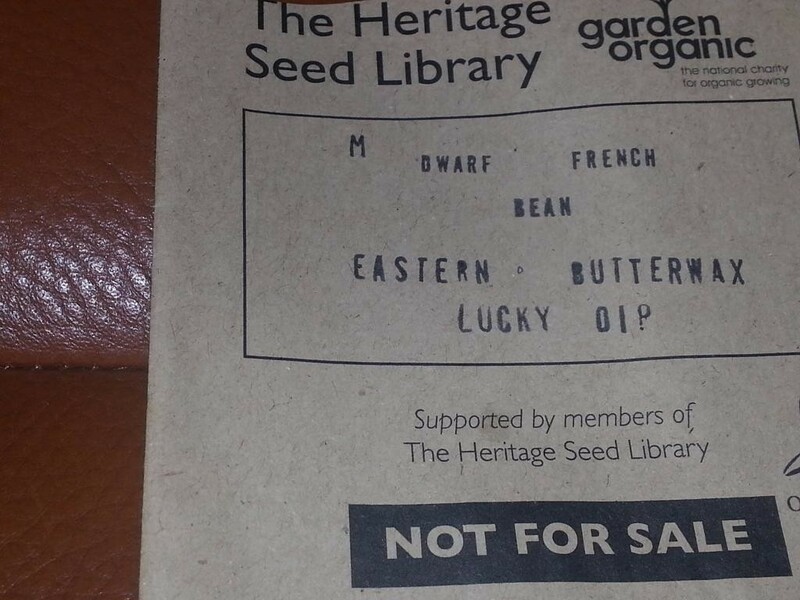 Eastern Butterwax – A variety held and maintained by the Heritage Seed Library. 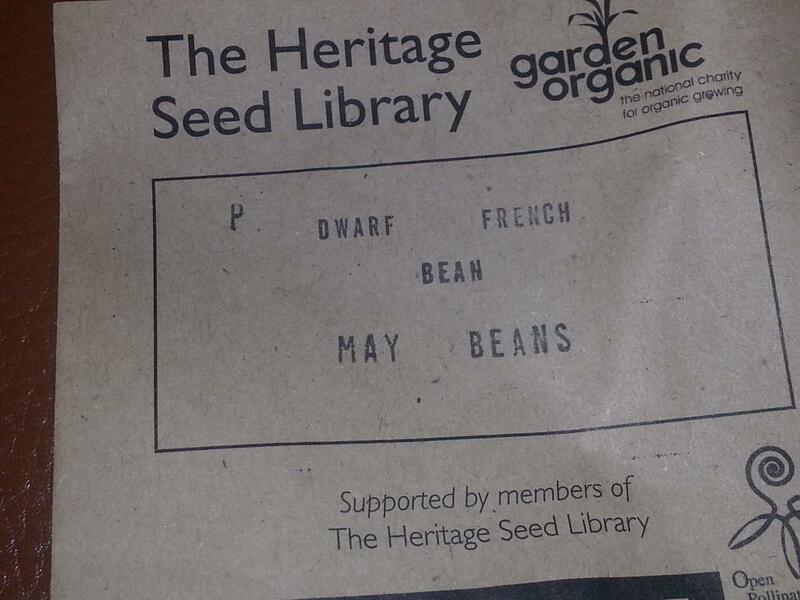 May – Seed sourced from Heritage Seed Library. 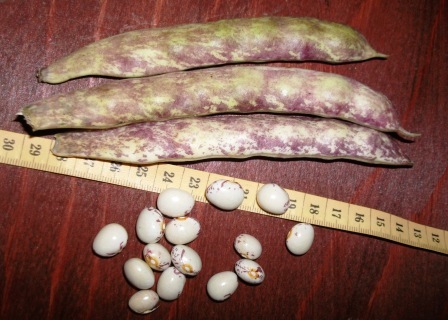 Vermont Appaloosa – A bush bean, although it can develop short runners. You can pick the pods as young green beans, but I found some a bit stringy. Best left to grown on for shelling beans. 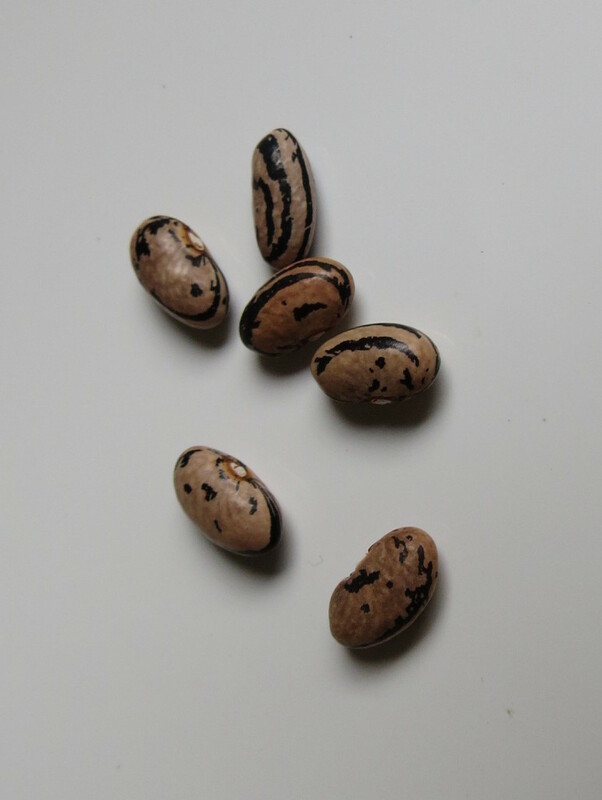 Seeds are beautiful to look at, dual brown and white markings and taste very good. Seeds sourced originally from Victory Seeds. Sugarbeet – Not much info to share with this veg other than, yes, it is sugar beet. My plants grew HUGE…plenty of greens for girls. 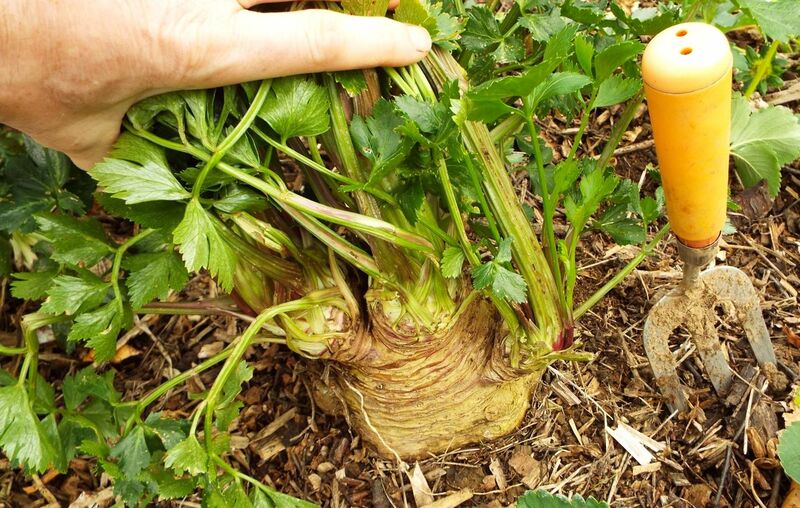 Out of 3 sugarbeet varieties I grew, this one ‘sprouted’ earliest and making biggest plants and seed heads. Seeds came from gardener in Wales, she said they were saved from old sugarbeet factory in Ireland when it was being demolished. There is no knowledge what variety is, but this gardener who I got them from, she has grown this beet and saved the seeds for some amount of years now. Following on from the beautifully bright yellow flowers, seed pods, still green and immature. Picture Jayb. San Marzano – A broccoli Raab/Turnip Broccoli. Giant Prague Improved – Sourced from Real Seeds. Said to be smoother than other varieties. Giant Prague. Picture Ian Pearson. These are freshly harvested and despite the name they not a nut at all, but a member of the sedge family which produces lots of small underground tubers. I’ve been growing these for several years and find they are easy to cultivate needing very little attention. I like growing them in pots or containers as the ‘nuts’ are then much easier to harvest. 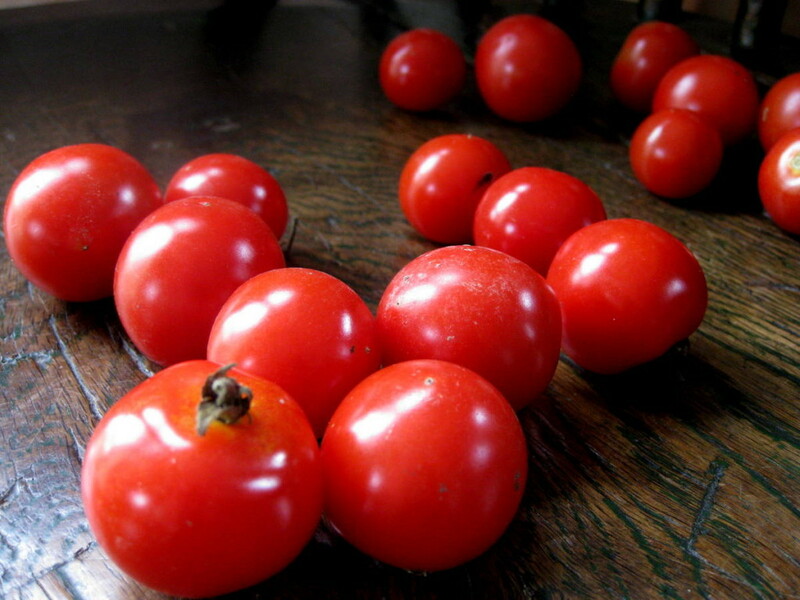 Beit Alpha – Produces stocky and quite long fruit, skin is tender and they have a lovely taste. Fruits hold well on the vines and they gave a good crop although not as productive as an F1. I found they grew well in my poly-tunnel, I’m not sure how they would do outdoors. 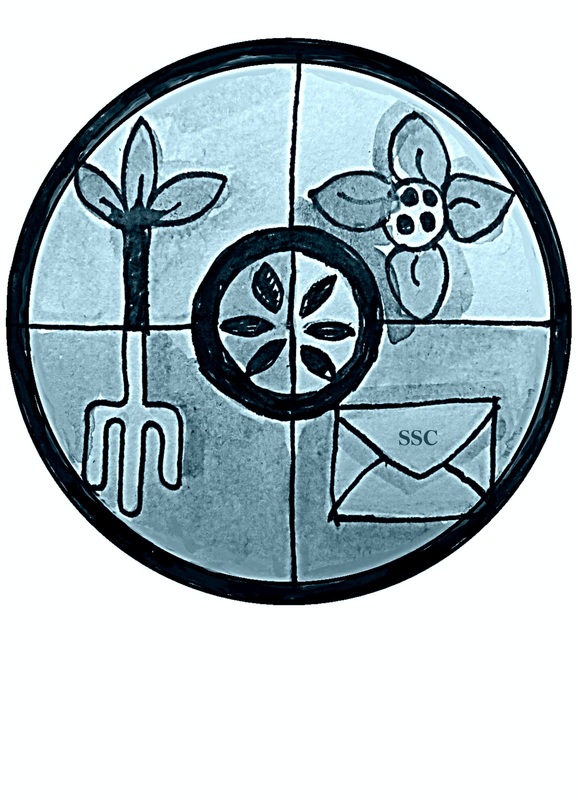 Seeds originally sourced from Baker Creek. Turkish -saved for the group by Ruud. Culinary Dandelion – Dandelion or Dente di Leone which translates as lion’s teeth. These are thought to “originally be from a packet of Franchi Seeds and are supposed to have thicker fleshier leaves than ‘wild’ dandelions. I found they were quite slow to get established, but eventually formed good big plants, but that’s probably down to being given space and lack of competition from weeds.” They are a hardy perennial with a long tap root, best surface sown as they need light for germination. Mispoona – Are Oriental greens and a modern day cross of Tatsoi to Mizuna. They have fairly big leaves and make a good size rosette, leaves are good cooked or raw. Best sown spring or mid summer. 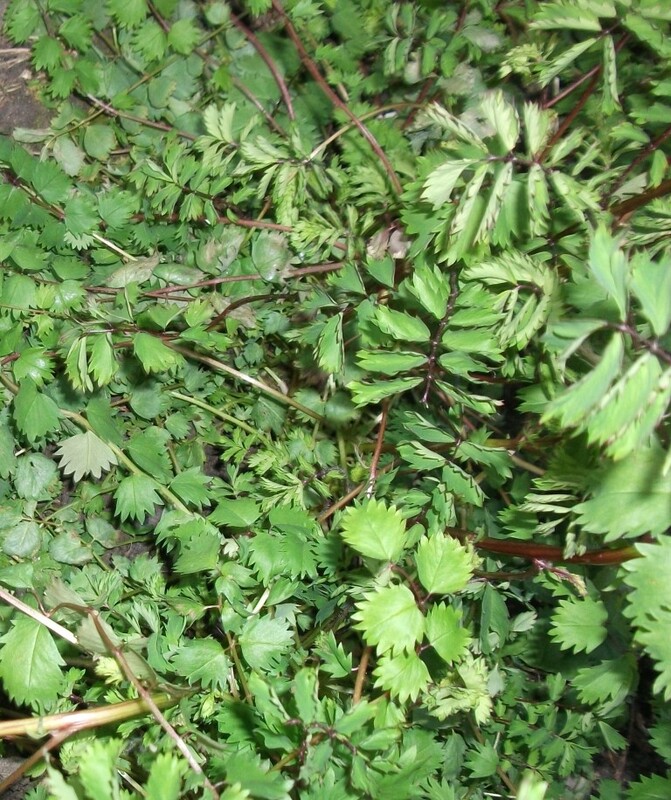 Salad Burnet – Salad Burnet is very easy to grow and fully winter hardy. 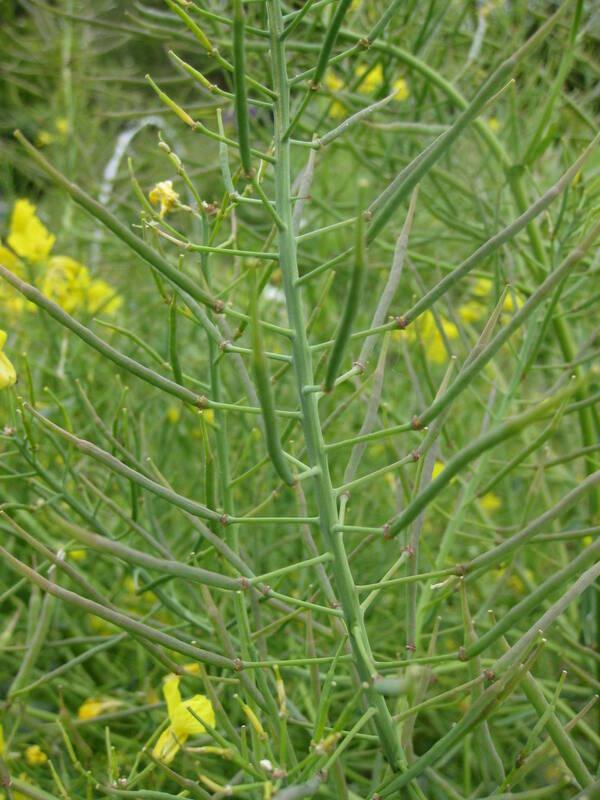 A salad herb with fronds of leaves that have toothed edges. Best are the young fronds with soft stems. Great in salads and sandwiches. Their flavour is reminiscent of cucumber. Salad Burnet plants flower in their second year and produce seeds. Despite flowering, the plants carry on making new fronds all the time. A good herb for the perennial garden. 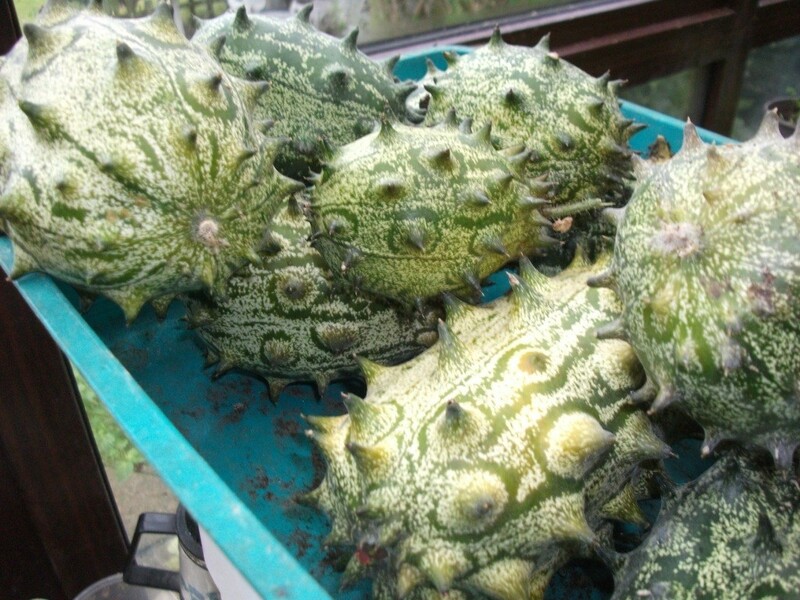 African Horned Cucumber aka Kiwano – This is a fun plant to grow and the dinosaur fruits are quite a talking point! However it is NOT content with a little corner of the greenhouse, as I found out to my cost! A bit like Achocha – it is rampant. At first I had a few problems with slugs, but once the plants took off, there was no stopping them. I had to direct the long vines out of the greenhouse door pronto or they would have swamped everything else inside. 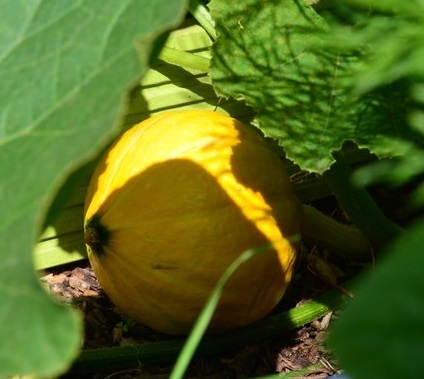 Maybe the best way of growing them is outdoors, cloched at first because they are not hardy, then let them ramble like squash. 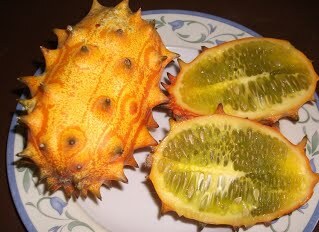 Kiwano is related to cucumber, but a different species, although the seeds look the same. I harvested the fruits before the first frost when one had started turning yellow. Apparently they can be eaten at any stage (by halving and spooning the contents), but best flavoured (tropical flavour, a bit like pineapple and passion fruit) are the orange fruits. We are eating the last ones at the moment in January. 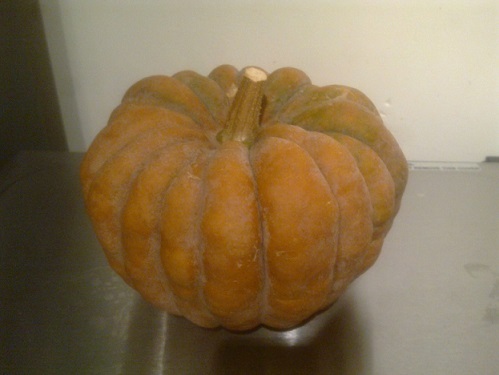 I had stored the greenish fruit in the conservatory and they were turning orange one by one. In the warmth of the house, they ripened faster. 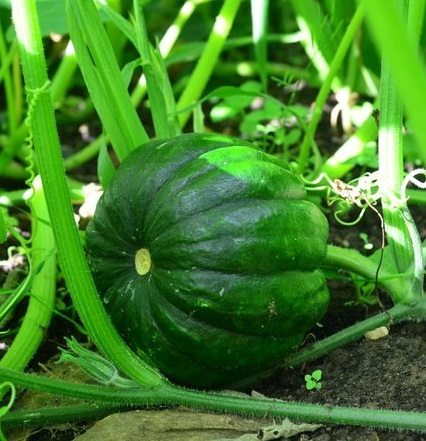 Greenish fruits have a more pronounced cucumber flavour. Ripe fruits, lovely colour combination. Picture Galina. 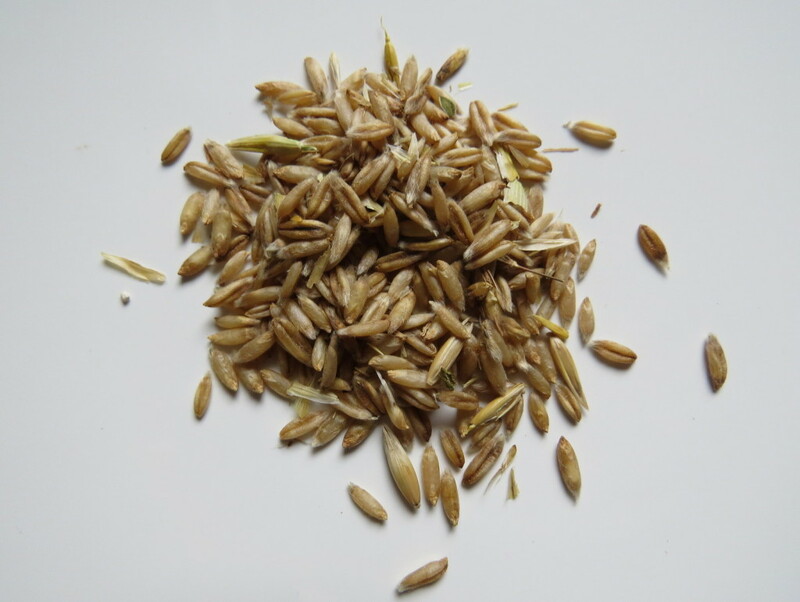 Hulless Oat – Just as the name imply, though some work is still involved to get the seeds out of their ‘husks’. Low growing variety that is said being better autumn sown, but, I did sow them in early spring into small modules and transplanted when still barely bigger than blade of grass, just big enough for root system to hold the compost in ball. They grew on well and produced worthwhile crop. I only harvested the ‘heads’ leaving straw for the land. 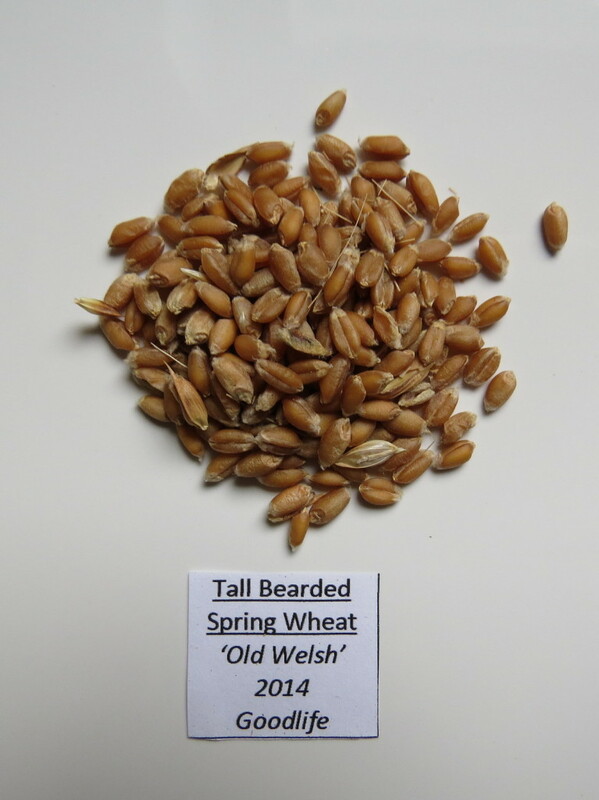 Old Welsh Tall Spring Wheat – Again, name says it all, it grows TALL, mine were 5ft. Originally the straw would have been used for thatching roofs and seeds for baking and/or feed for the animals. I’m still to put the resulting crop to test in ‘bakery department’. The straw is lovely and long, very strong and ideal for anybody who would fancy doing some straw crafts. Even if you don’t need the grain, birds would happily help you out, but the straw is good for the land and is easily chopped to rot down over winter, or harvested for storage and used as mulching material later on. Useful stuff! Seeds were sourced from JI centre. Dduk Seom Jeok Chuk Myeon – Korean Wrapping Lettuce – A local seed swap event offered something really surprising – a seed packet from Korea without any English text! 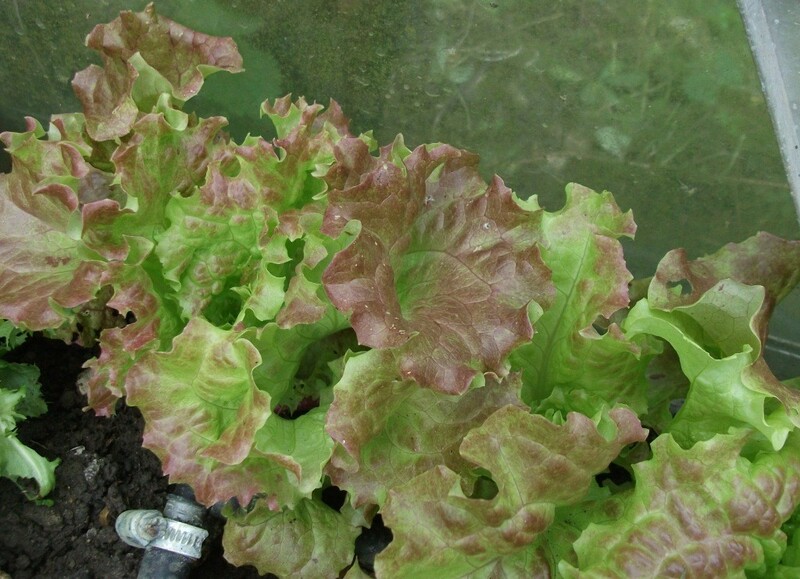 The picture showed a large loose leaf lettuce with red, frilly edges. It was unopened and slightly out of date. I love a bit of a mystery and tried to find out what I could on Google back home. This lettuce is a ‘Wrapping Lettuce’ from Korea. The large leaves are indeed very suited to this purpose. I have wrapped curried eggs, portions of hummus, individual meatballs with barbecue sauce and many other items for party finger food. Needless to say, it is just as good tossed in a salad bowl with a classic French dressing. A few leaves at a time, picked from several plants, fills the bowl quickly and the plants keep on producing for a long time. Picture shows young plants in spring. Korean Wrapping Lettuce. Picture Galina. 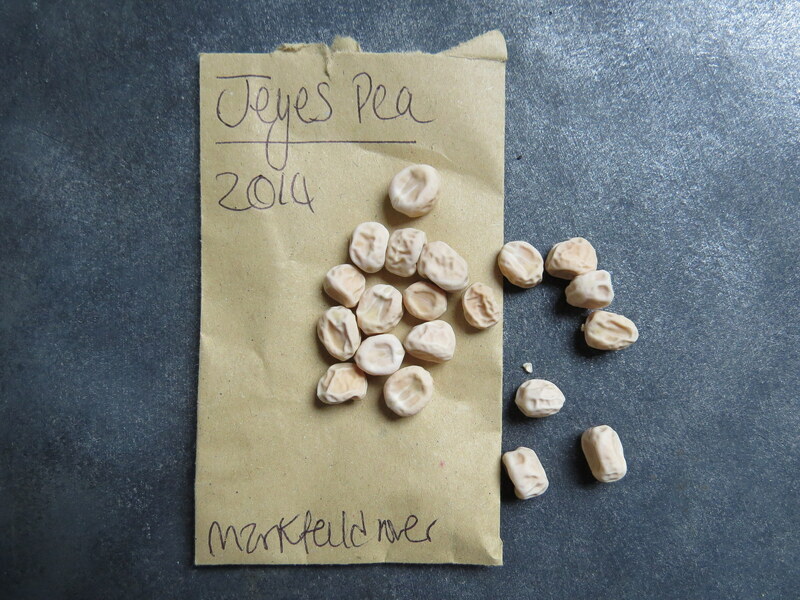 Jeyes – A climbing Heritage pea grown by Markfield, seed sourced from HSL. 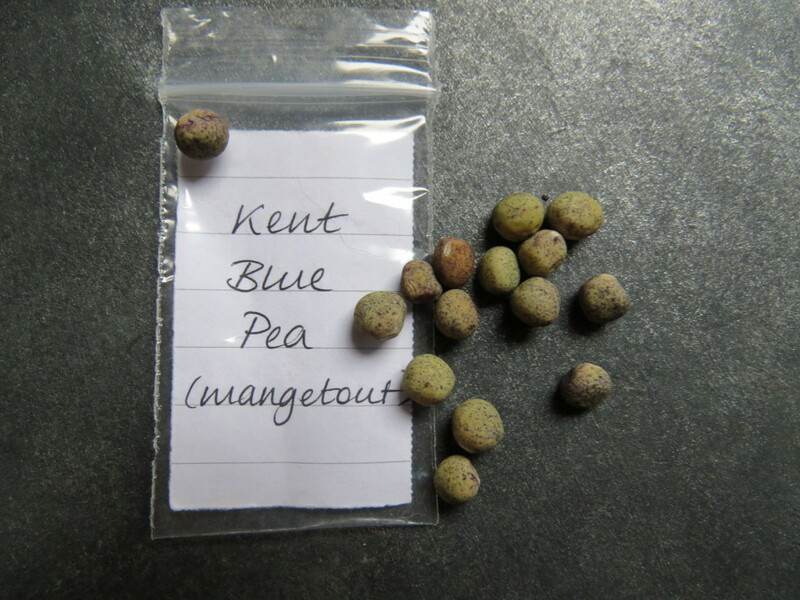 Kent Blue – Grown and shared with the group by Sparrow. 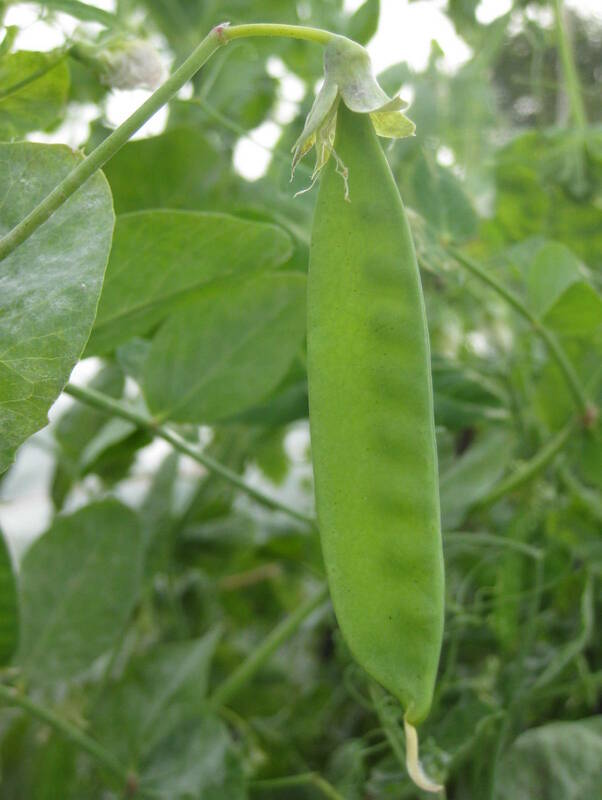 These peas date back at least to the 1940, since when they are reported to have been grown in Sevenoaks. They are fairly short growing. Flower colour contrast. Picture Sparrow. 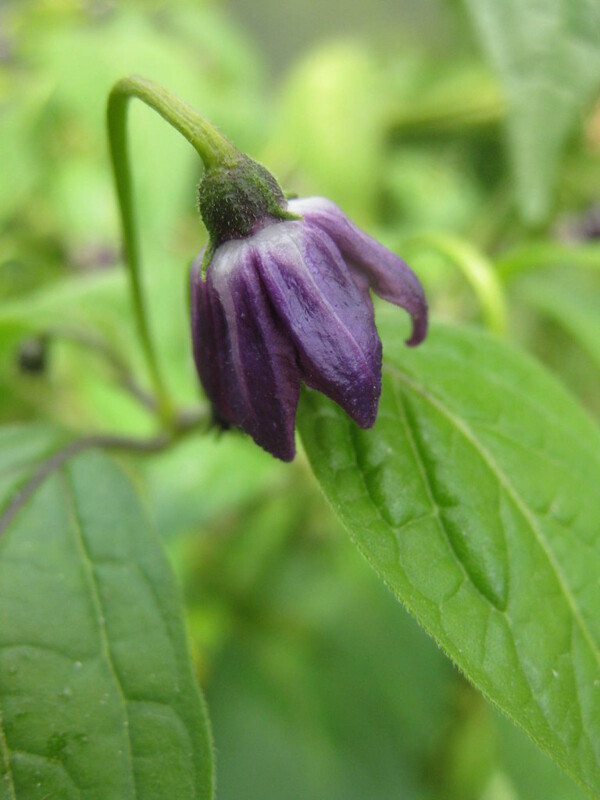 Mrs Lei – I know very little of the origin of this mangetout, possibly a Japanese bred variety? I found they grow to around 5’, producing masses of beautiful salmon pink and white flowers which are born singularly, followed by tasty sweet pods. These look stunning growing on their own, or amongst other varieties. Needs supports to climb. Straight green pods. Picture Jayb. 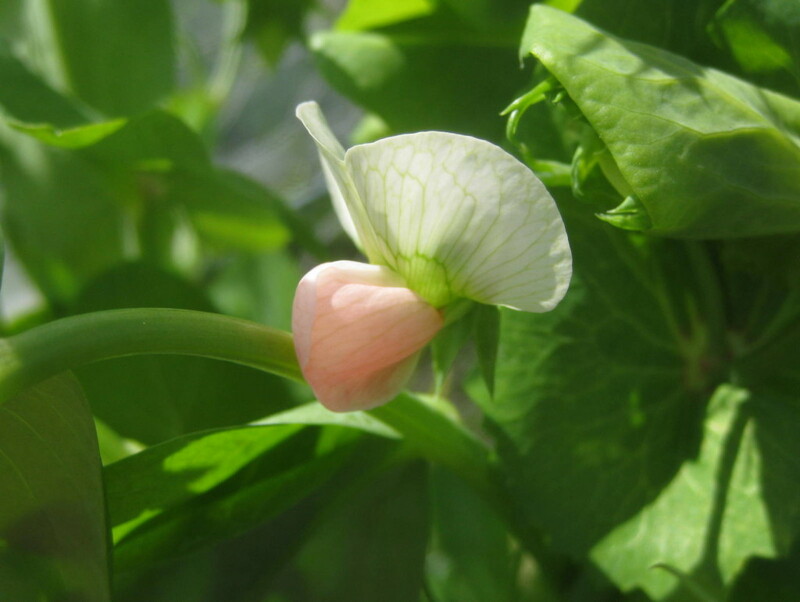 Sugar Lord Snap Pea – This is the pea that Goodlife rescued in 2013 from a donated packet that should have been sown by December 2000! Her extraordinary ‘green fingers’ managed to germinate 11 of these ancient seeds and grow the plants to maturity. 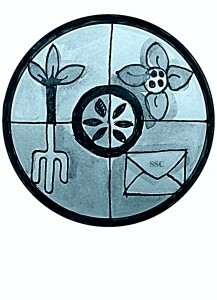 Goodlife then shared her seeds and we both grew Sugar Lord for the seed circle this year. 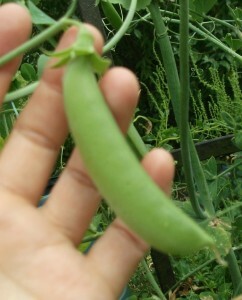 It is a large snap pea. 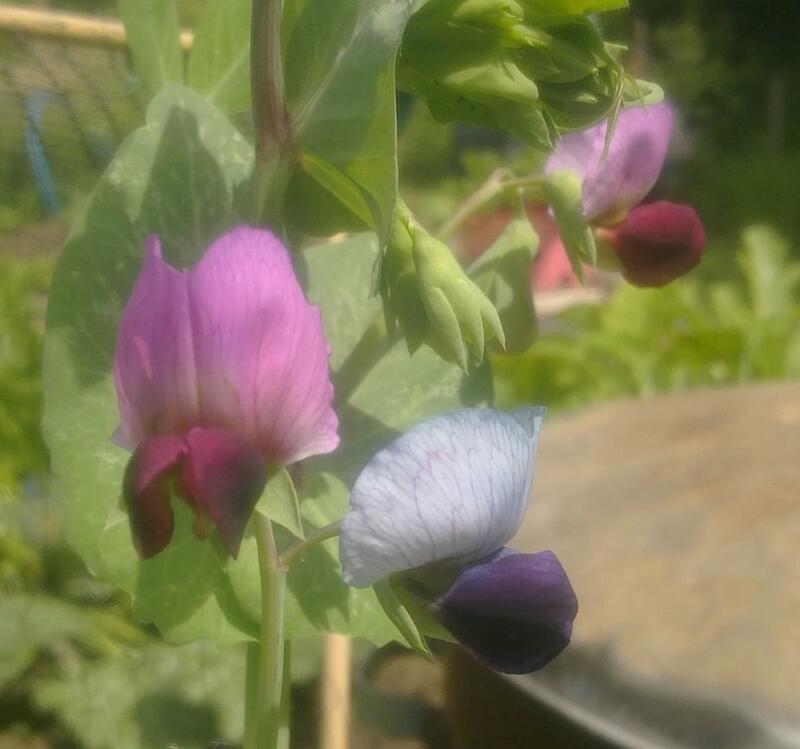 The original packet from Marshall’s seeds said ‘Mangetout’ but it is a fat podded snap pea rather than a flat podded mangetout. The pods are the largest of any snap peas that I have seen and they taste very sweet, meaty and crunchy. 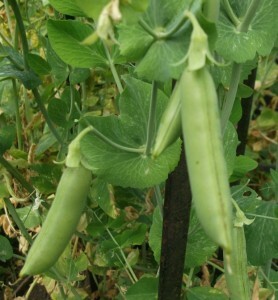 I had both early and late peas on tall plants which were grown with 8ft supports and reached the top. 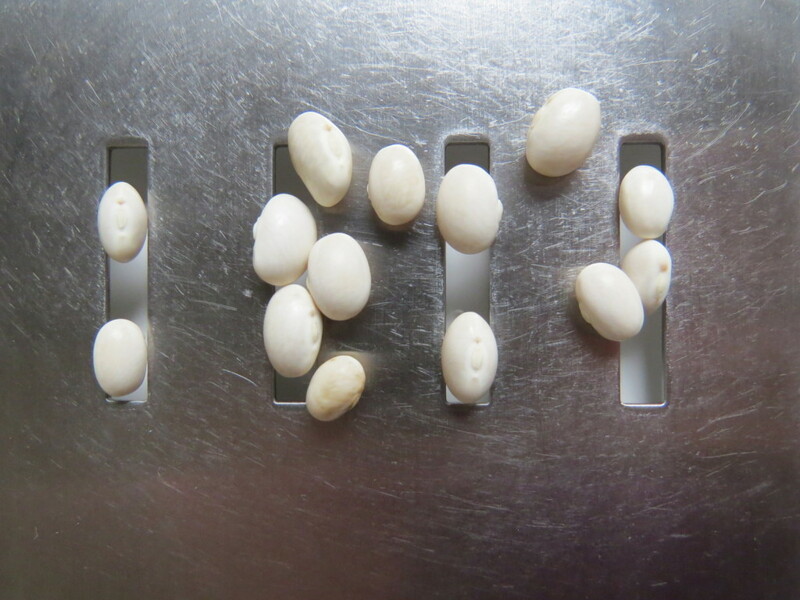 The size of the pods was a little variable, but most were like the one in the photo on the right. More like a very sweet French bean. Not many needed to fill a saucepan. Goodlife found out recently that a Finnish seed company is offering Sugar Lord for 2015. 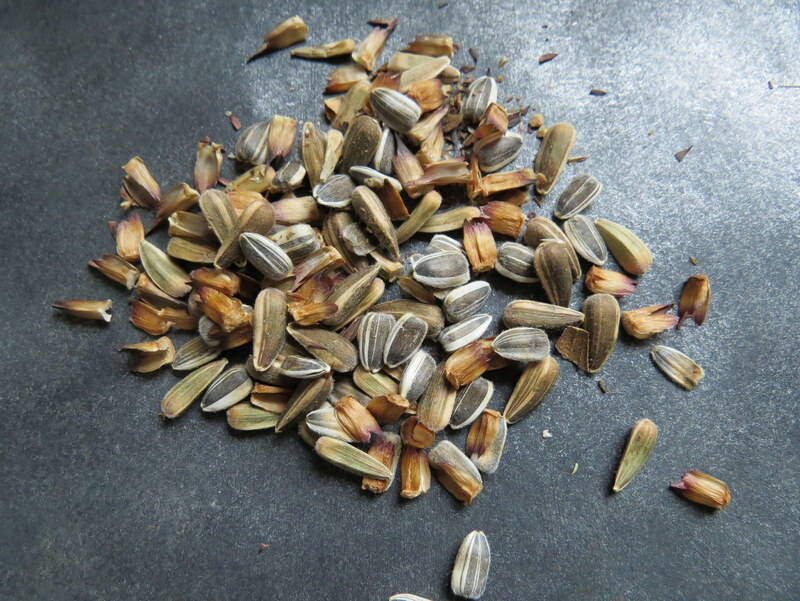 However, this variety has vanished from the seed trade in the UK (not even the Heritage Seed Library offer them). Which means that currently these peas must be considered to be extremely rare. Many gardeners do still remember them fondly, and have tried to find seeds to grow them again, but this proved very difficult. For this reason. 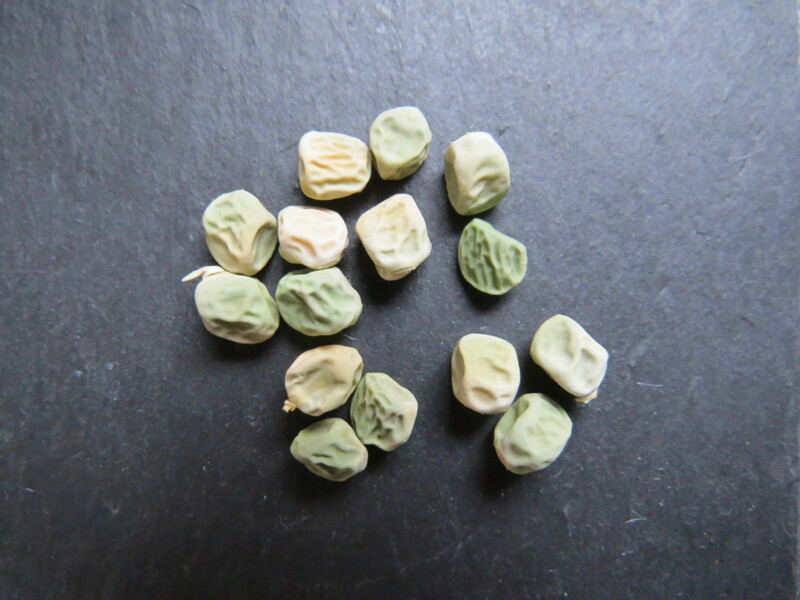 (and because it is a very tasty, tall pea variety that we definitely want to grow time and again), Sugar Lord would benefit from a few more seed savers helping to bring it back into wider circulation in gardens and on allotments. Not difficult to grow, but needs support. Telephone – A tall white flowered variety producing a very good crop of very tasty peas. 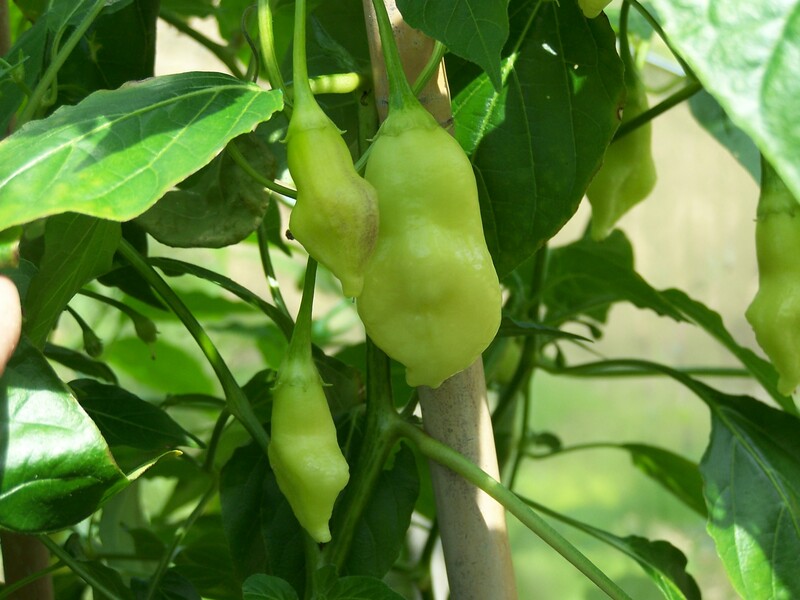 Aji Fantasy (C.baccatum) – This is Finnish bred and patented variety that is sweet and very mild, often having pods with virtually no heat at all, hotness no higher than 4/10. 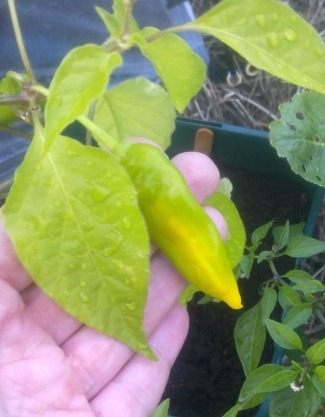 Plants can grow quite good size, producing numerous amounts of these ‘funny’ shaped pods. The ‘strain’ of seeds I have does produce almost white fruit, looking slightly more creamy yellow when truly ripe. 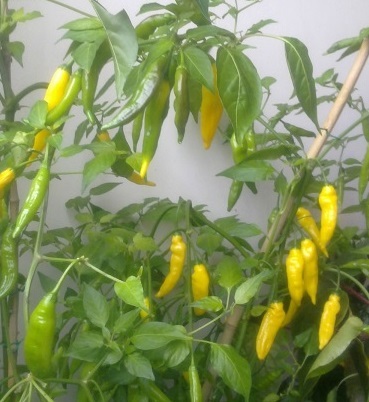 The original variety does produce more yellow coloured fruit and both ‘types’ are now in circulation amongst growers , though only the original producer (Fatalii seeds) does sell the ‘original’ strain. Nice chilli to eat raw as ‘salad’ veg and it doesn’t mind being cooked neither. Fruit starting to turn colour. Picture Sparrow. A lovely crop of hot peppers. Picture Sparrow. My seeds were from Jeannine’s amazing parcel. 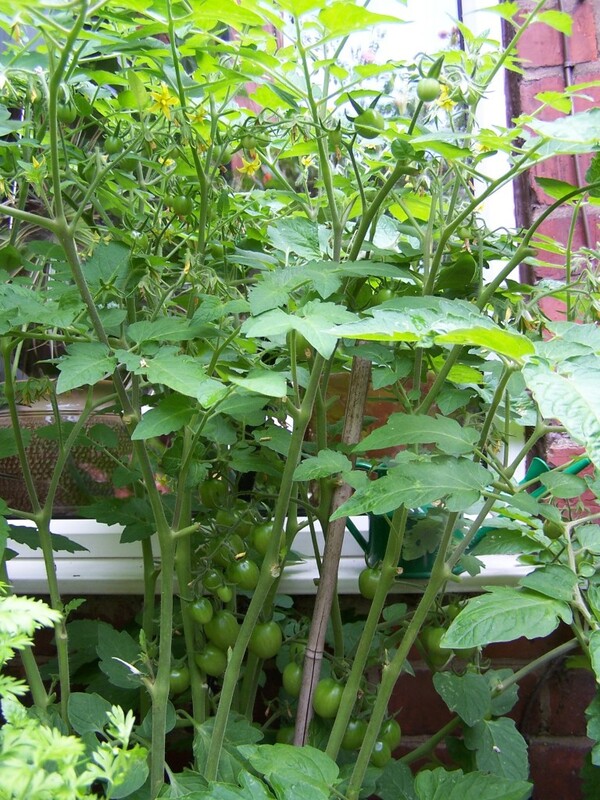 The plants grow quite tall – 60cm – and need a large pot or to be planted into the ground or greenhouse border where they need about the same space as a small tomato plant. I took them indoors over winter and replanted. They did better the second year and produced at least 50 fruits per plant. 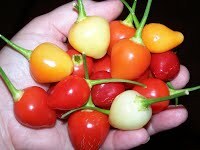 These are the peppers that are used in the commercial ‘Peppadew’ products. It has been difficult to source seeds for them. They are very fruity and mildly hot – really only just a tingle. A short boil in lightly salted, sugared water with one spoon of vinegar brings out their full flavour and softens the fruits, ready to be filled with cream cheese. I have also used them raw and in cooking and find that cooked practically all heat disappears. A good pepper for those who don’t like heat, but appreciate a bit of pepper flavour. Piri Piri – These were grown in isolation from other varieties in a green house, although there may have been other peppers in the vicinity. A very hot variety and seeds originally came from an A4A seed swap. 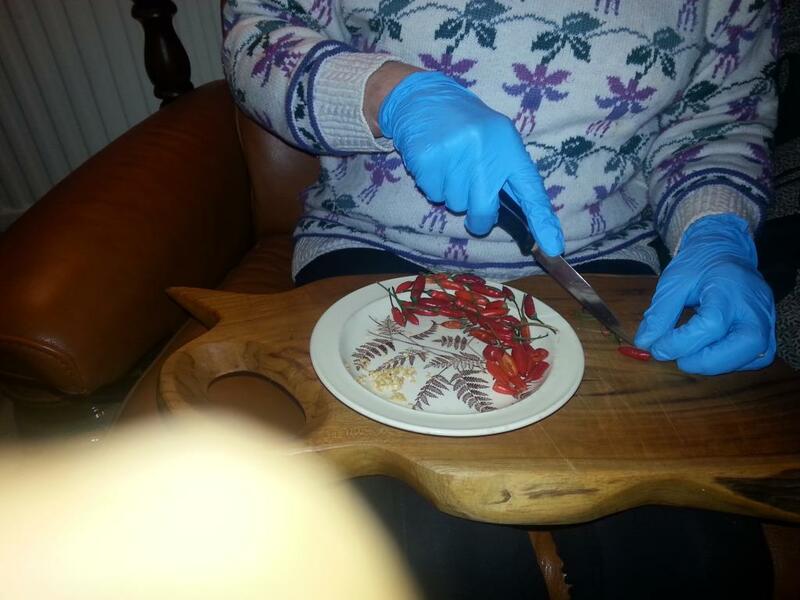 Pumpkinlover busy de-seeding Piri Piri chilies. Picture Pumpkinlover. 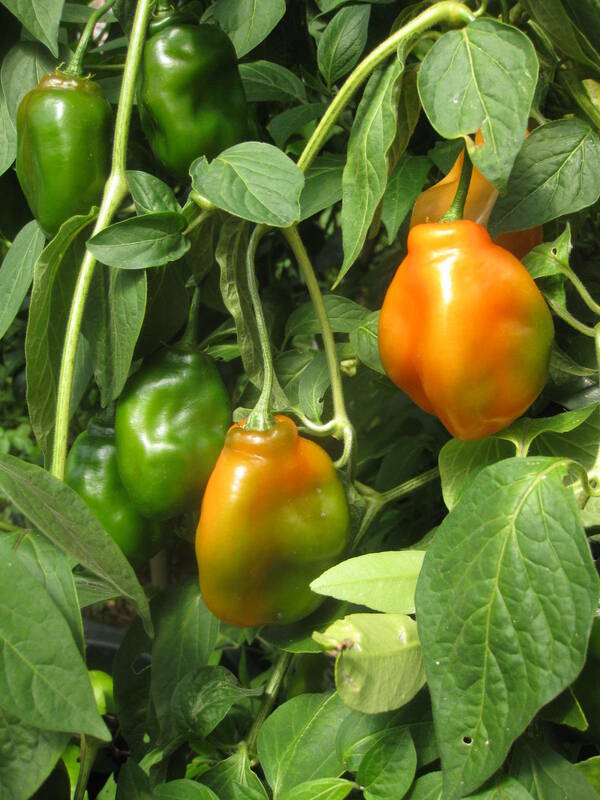 Rocoto Orange Manzano – These are a super chilli to grow with pretty hot hot orange fruits. My plants overwintered in a poly-tunnel and went on to produce huge plants the second year, loaded with gorgeous orange fruits. I’m still picking them in December! Fruits ripen to a bright orange. Picture Jayb. Trepadeira Werner (C. baccatum) – Cherry ‘look-a-like’ small fruits that ripen from white to red, has berry like aroma and good sweetness. Medium heat and the plants are easy to grow in pots…growing more wider than height. I found the fruit is nice to use in all stages of ripeness, white being my favourite. Fruit ripen from white through orange to red. Picture Goodlife. 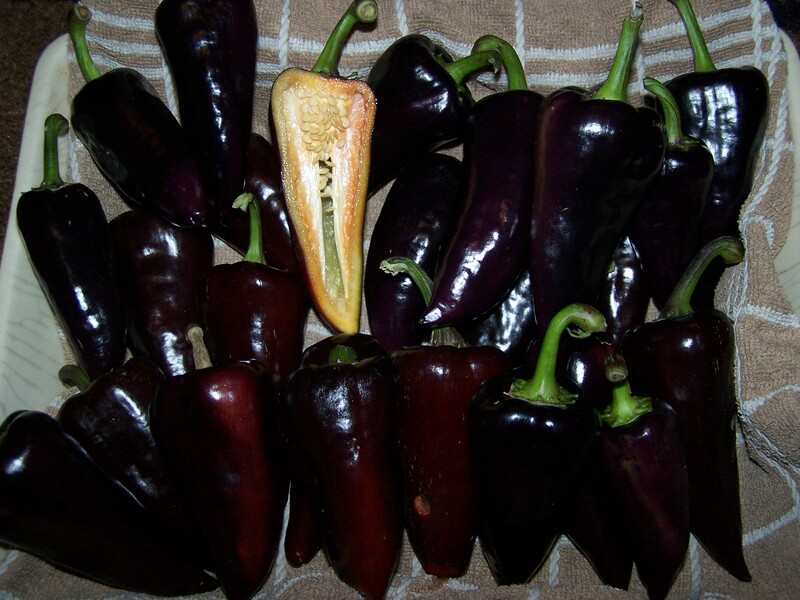 Tsygansky Baron – Purple ‘palm-size’, smallish pepper. Pleasant taste, not overly sweet nor that strong neither. Not thin fleshed nor very thick. 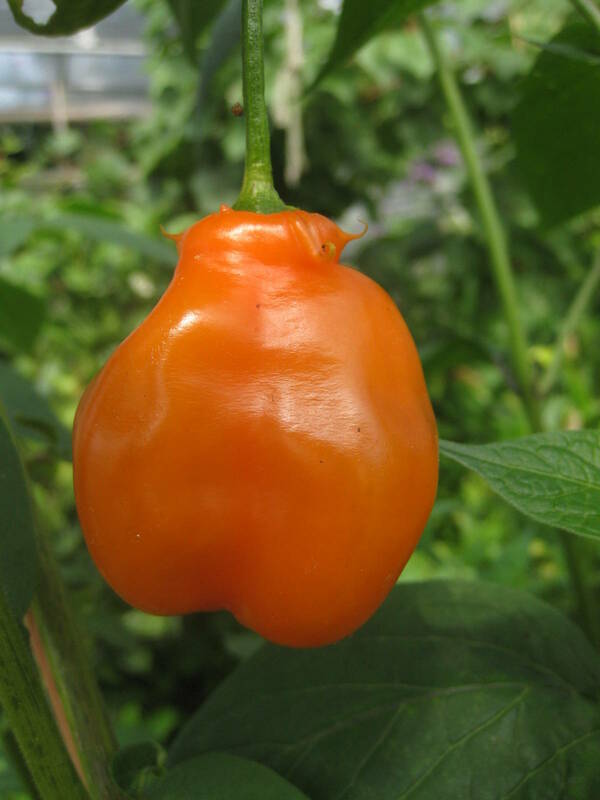 Everything about this peppers qualities says ‘good enough’. Admittedly it is ‘just a pepper’, but at least it looks good. BUT, if anything is going for it, it does crop plenty of fruit and I have used them for almost anything and everything and cannot say they’ve failed the ‘task’. I’m very happy to grow them again and because of it, they are worth of posting for others too. 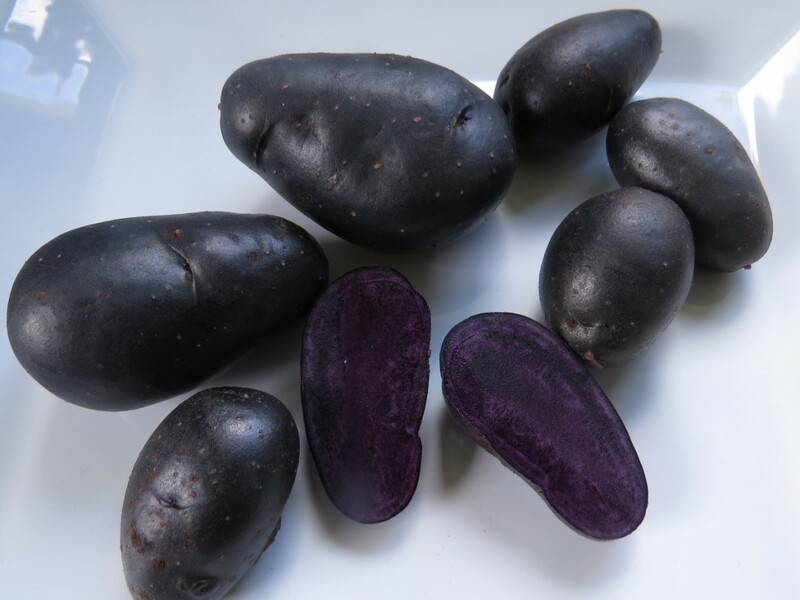 Violetta TPS – Violetta are an early main crop potato bred from Emma x Highland Burgundy Red. They are described as a fingerling type but I thought they were more a long oval. 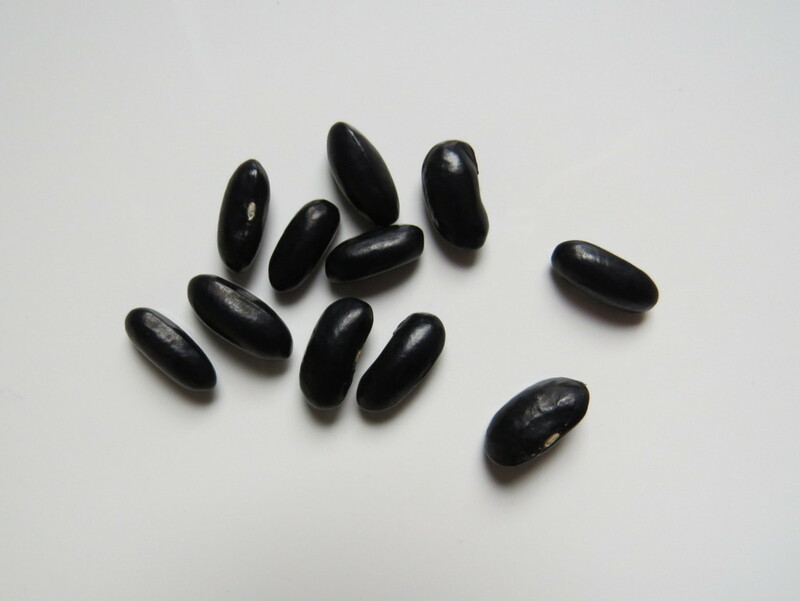 They have a lovely blue-black skin and flesh, taste overall is good, although with antho taste. Violetta readily set seed and these could be selfed seed or possibly cross pollinated if the bees were busy! These seeds should give a good range of colours, red, blues and some whites, and anywhere in between. There will be a mix of types. The beginning of March is a good time to sow TPS if you want a first year crop, or later for mini tubers to save for following season. One of the parent plants in bloom. Picture Jayb. 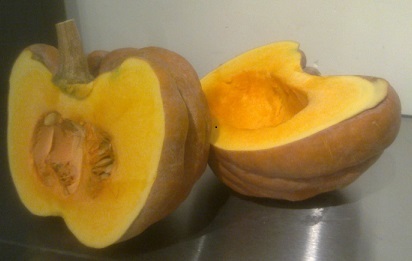 Freshly harvested, the colour inside is quite intense. Picture Jayb. 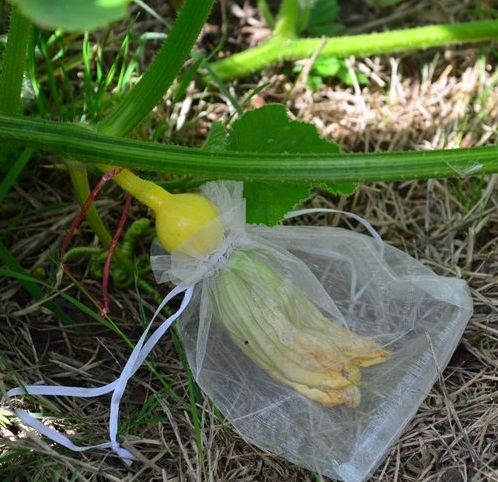 Bagged flowers for hand pollinating. Picture Sparrow. Ripening nicely and taking on the beautiful mature colouring. Picture Sparrow. 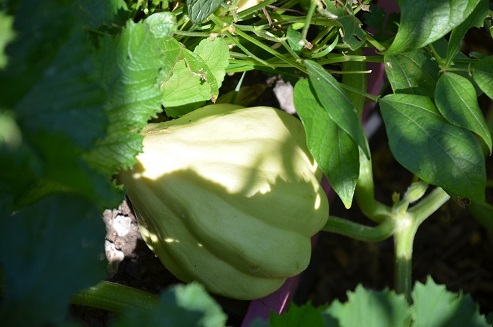 Temprano de Argelia – (translates to ‘Early of Algiers’) courgette. An early green courgette, which did well in the garden and was productive. Seed was from Jeannine’s parcel. A young Thelma Sanders . Picture Sparrow. 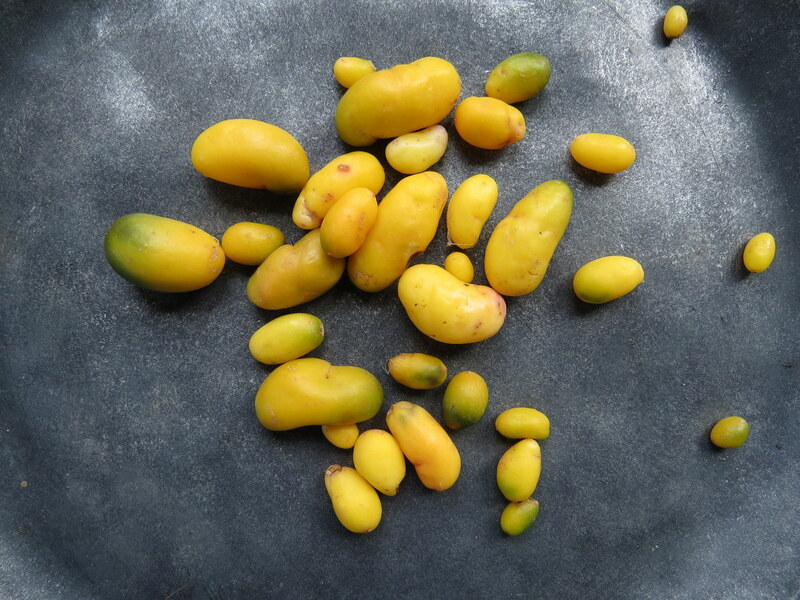 Cisineros – These really do have big green fruits, lovely variety, possibly a bit later than some. 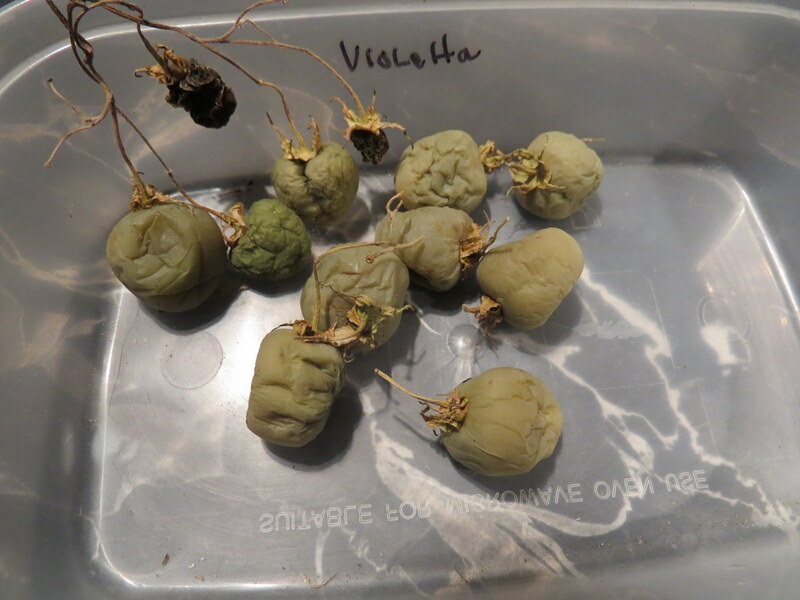 Be sure and grow more than one plant for pollination if no other tomatillos close by. 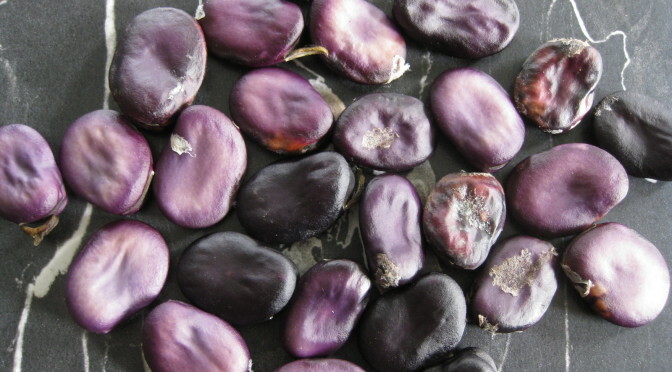 Betimes Macbeth – These are one of Tom Wagner’s varieties, bred by him to be very early and productive. The plants are low growing, determinate and do well in cooler conditions. They produce large cherry size fruit, ripening to a very intense red. Flesh is thick and the fruit stays firm for quite a while both on the vine and when picked. They produce a good crop despite the poor summer, being early to set and just carried on going. A good candidate for an early sowing or an autumn cropper. Avoided blight pretty well a few leaves were affected early on, but once removed recovered well. 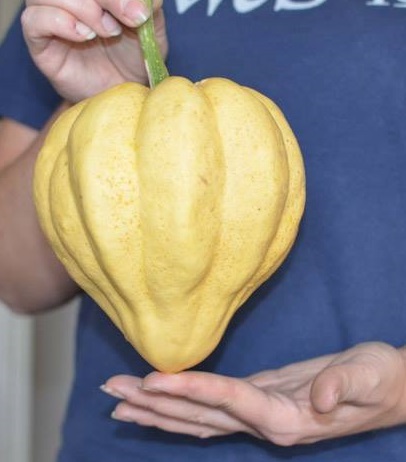 This variety doesn’t produce many seeds per fruit. Taste is fine for an early cropper but perhaps won’t compete mid season, but they do cook well, lovely oven roasted, on the BBQ or oven roasted for pasata. Very early, small determinate plants. Picture Jayb. Shiny red ripe fruit. Picture Jayb. Blush – A cordon elongated cherry type. 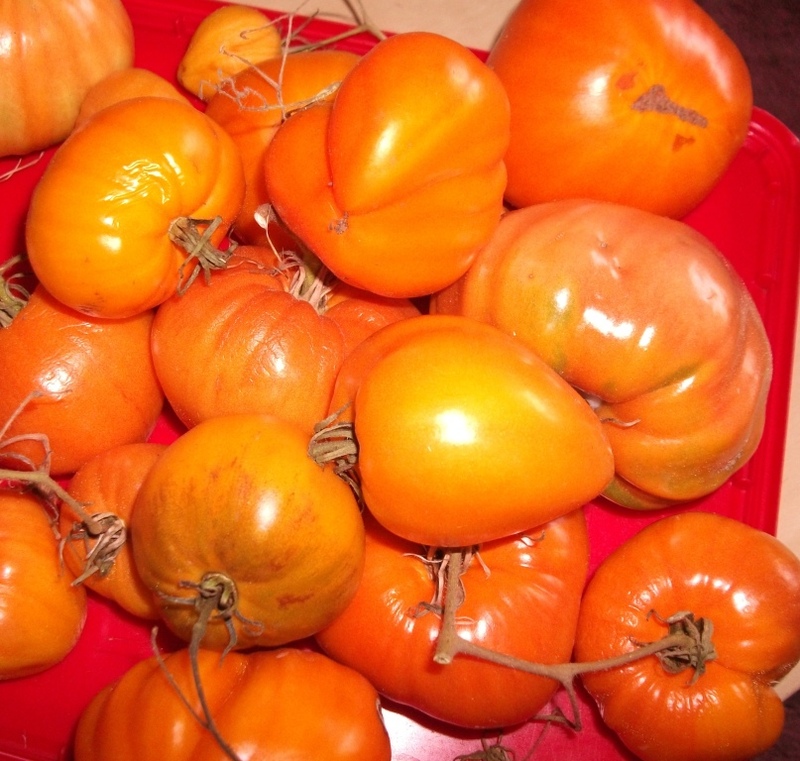 Blush tomatoes are a recent introduction, bred by Fred Hemple, California. 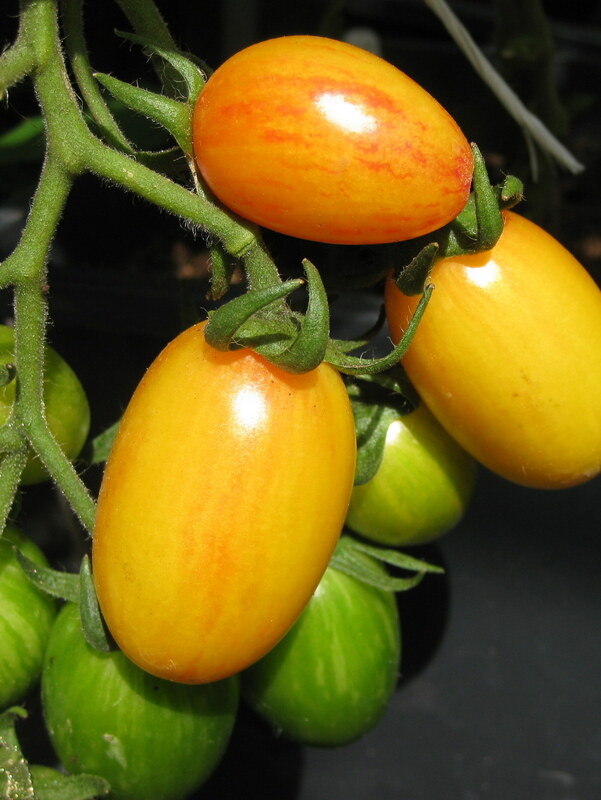 They produce quite sweet yellow blushed with orangey – pink striped elongated cherries. They look lovely in a mixed bowl or oven roasted. Detsky Smak – Determinate bush with regular leaves, growing up to 1 metre tall. They are quite strong growers, but will eventually need some support because the weight of the crop. Although pruning is not generally recommended (plants producing flower trusses all over the place), I found removal some leaves and shortening new branches after truss or two being necessary for plants own well being, it is almost like they try to achieve too much! Good yields of small orange red fruit that majority are slightly oblong though round shaped ones are formed too. Best suited to grow undercover, but I found pot grown plants being still successful if pre-grown in GH to good size plants and moved to outdoors later on. Not specifically meant for cooking, more of ‘eat straight from the bush’, but I found their sweet flavour did came out better when slightly heated through, stir fries, pizza topping etc. Loading up with fruit. Picture Goodlife. 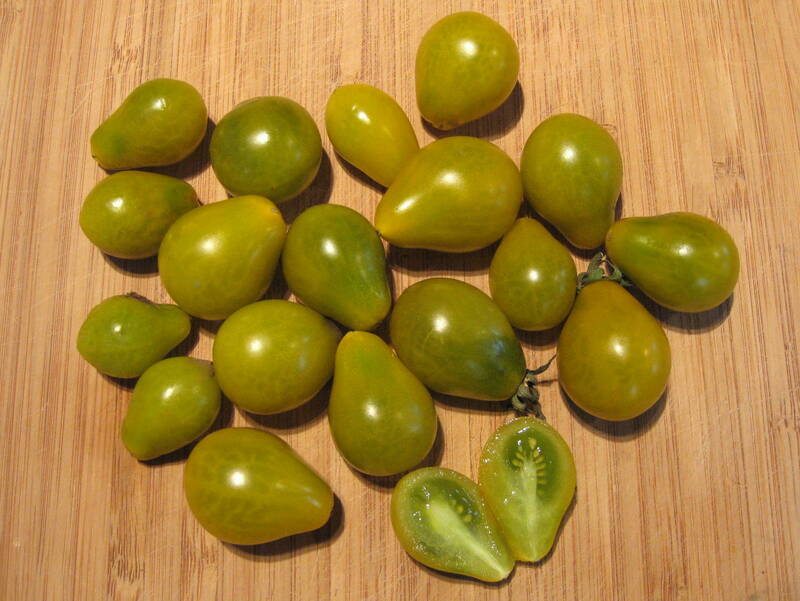 Green Pear – Cordon cherry tomato, producing gorgeous sweet tasting, green when ripe little baby pear shaped fruit. These just taste so good and I’d happily grow them each year. Green when ripe fruits, althought these have yellow skin so take on an amber hue when fully ripe. Picture Jayb. Katja – Special because of its superb flavour, and its earliness. 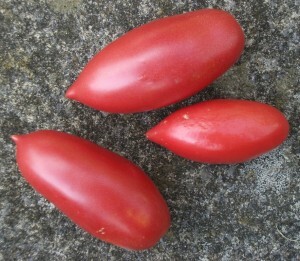 An outdoor pinkish beefsteak, said to be semi-determinate. 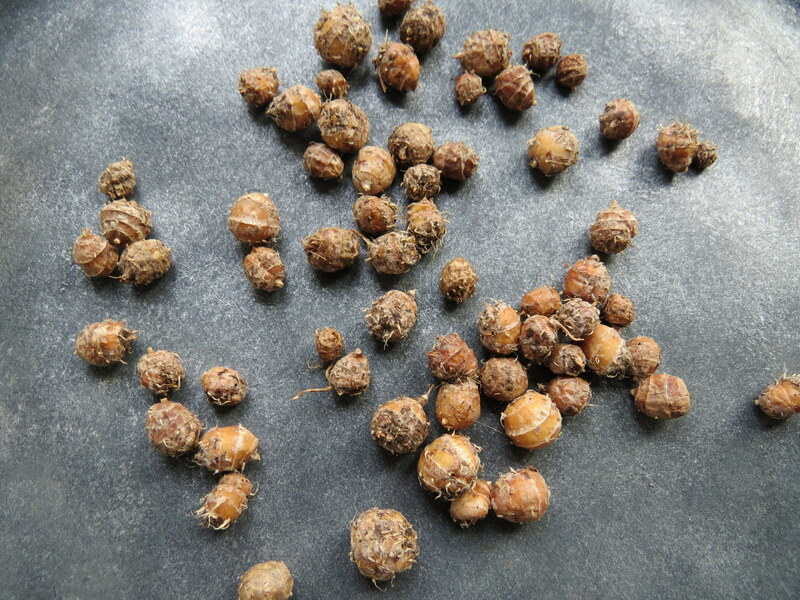 I find they grow to about 6′, and produce fruit with very little watery pulp, and few seeds. Obtained directly from Soren Holt in Denmark several years ago. 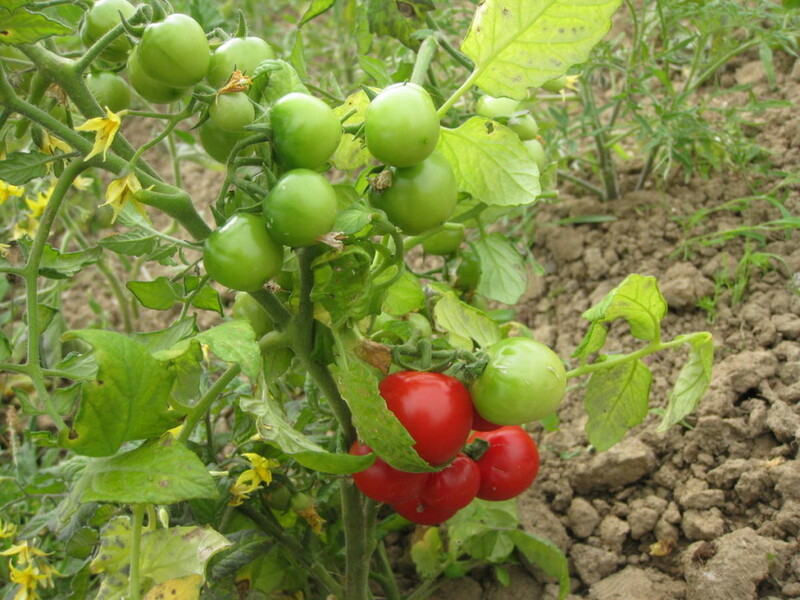 Lylia – Small cherry tomato on long trusses. 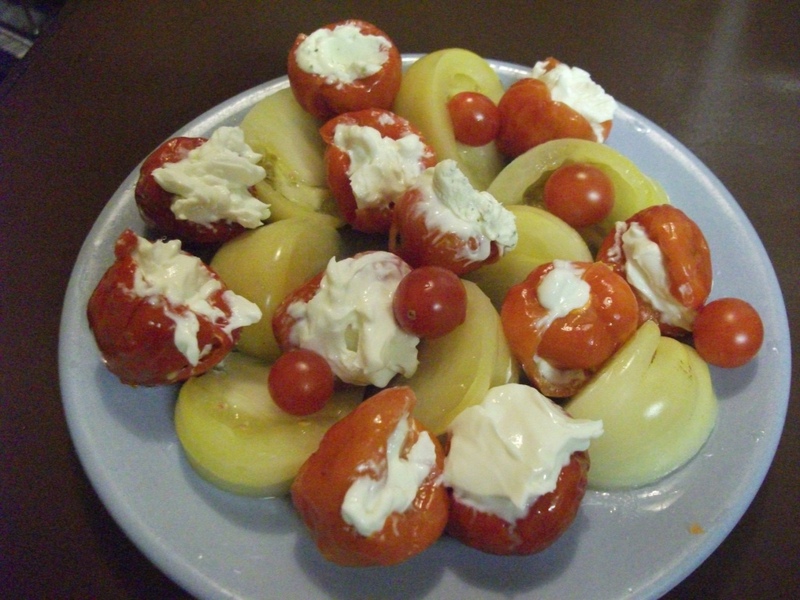 Lovely sweet ‘lunchbox’ type tomato (provided they ever make it there – most of mine were eaten straight off the vine). A French heritage variety for both greenhouse and outdoors. Ripe on the vine. Picture Galina. 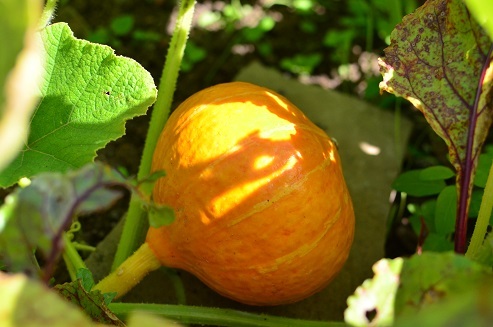 Rosalie’s Early Orange – Heart to beefsteak shaped large fruit on strong plants. This variety is definitely better outdoors than the greenhouse and much earlier than other tomatoes of this size. After a blight attack here, these plants rallied and provided fruits into November. This was also my entry into this year’s large tomato competition. Early fruits are well over a pound, later ones are smaller. This is one of those varieties that are seedless on early trusses. Still low seed-count on later trusses, but there is so much fruit, it is not hard to save seed. Nice, rich flavour too. My seed source was from the tomato internet trials of 1999/2000. 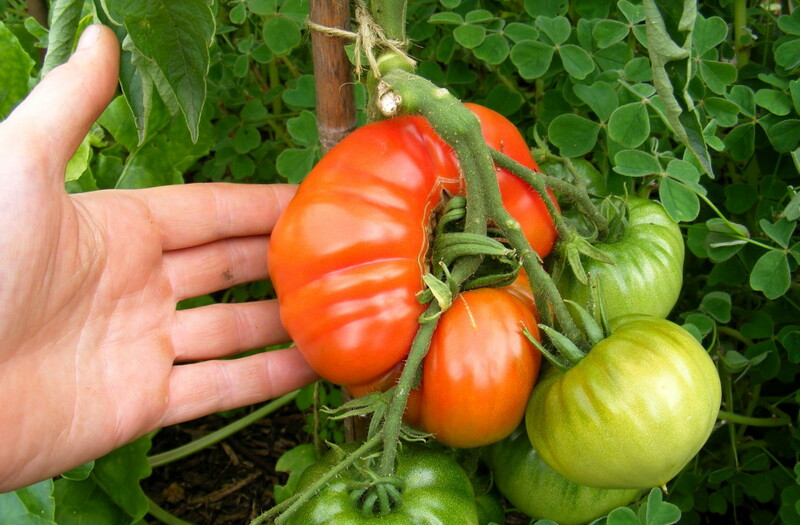 SC2121 – This is a medium early determinate tomato and is commercially grown in Turkey. 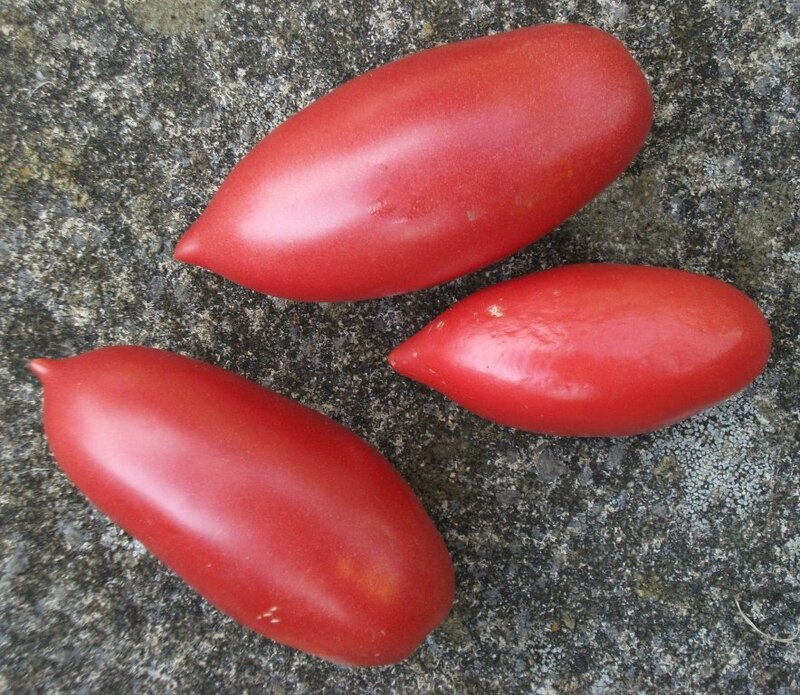 “I bought the seeds on a market in Turkey.The tomatoes are salad kind of tomato golf ball size big, they are producing well in a greenhouse never tried them in the open.” Fruits are red around 160g. Snowdrop or original name Podsnezhnik – This is quite new variety from Russia, advertised as ‘frost resistant’ and ‘super early’. 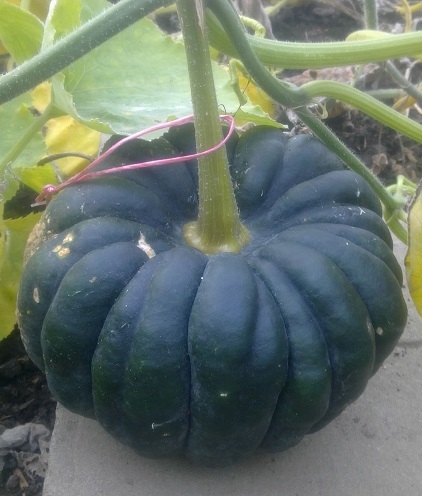 It is low growing variety and I grew it outdoors in open ground, plants didn’t make much tops and could have been planted quite close together. I’m planning to have another go by growing in row formation allowing plants to support each other. 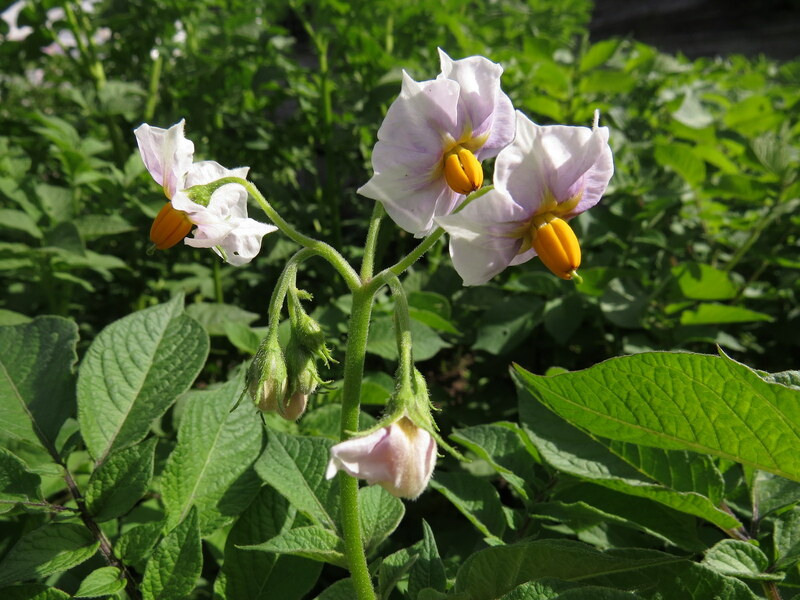 This variety IS RECOMMENDED to be sown mid-April, grown undercover and get out planted by beginning of June, this advice is for north-west region of Russia, Karelia area where show doesn’t melt away until May, sometimes even later! So here in UK we could plan the sowing and planting couple of weeks earlier (in theory at least). 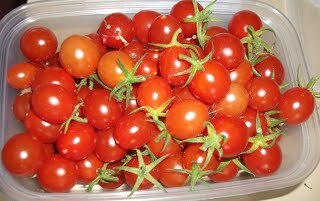 Fruit is medium sized, roundish red, more of salad type and can have little bit green on shoulders, little bit ‘rustic’ looking. Because of its low growing habit, I found it good for containers too. 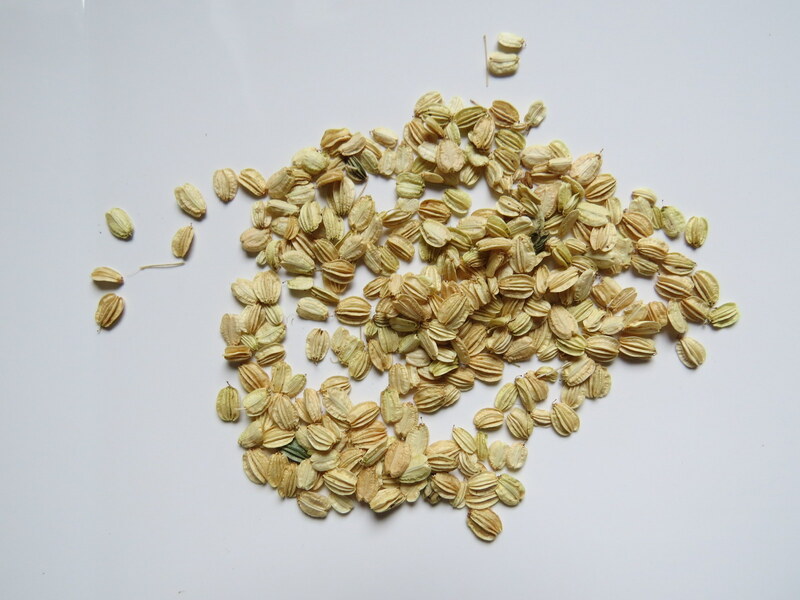 With adequate care this variety is said to crop 1.6 kg per plant. 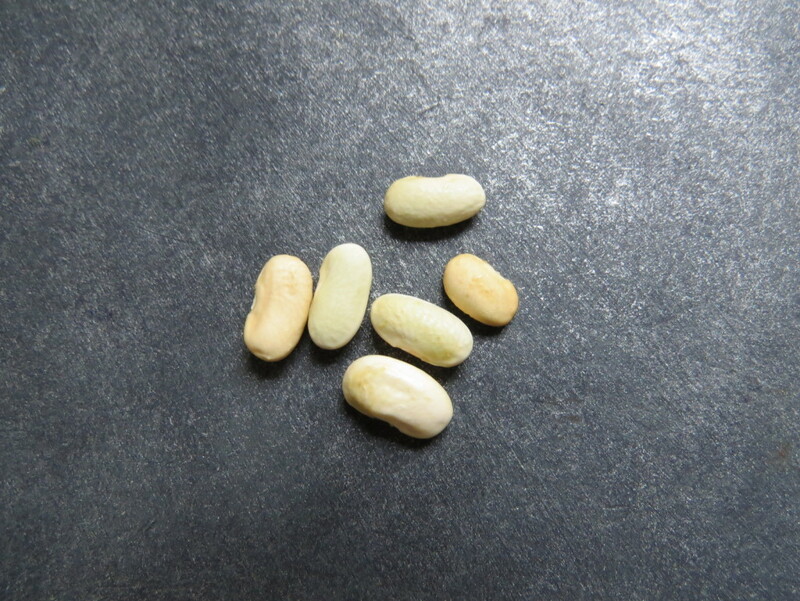 I’ve tried to look carefully manufactures site and I cannot find any info that this variety would be hybrid, so I have saved the seeds in faith that this is not such a variety. Sosulka Rozovaya – Which translated means Pink Icicle. A high yielding, very pretty and a good tasting variety too. There are several of these fruits on every truss. 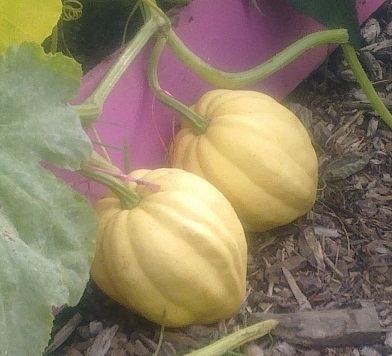 I grew them in the greenhouse and outdoors this year and was pleasantly surprised at the blight resistance. I was still bringing last fruits indoors in November. The long, spindle shape looks stunning. Sister variety to ‘Black Icicle’ which were in the circle last year – or ‘Sosulka Chernaya’ to give that variety its proper name. Also of Ukrainian origin. My seeds were from Jayb. Sweet Aperitif – A recently released and British bred variety. 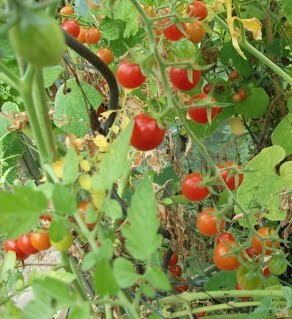 Which produces large trusses of small, very sweet red cherry tomatoes with good flavour, a new favourite for me this year. I grew mine in the greenhouse but it is reported to grow well outdoors in a sheltered sunny spot. A cordon, needs pinching and staking. I think a top variety. An Andean Tuber, I’ve rather neglected the last couple of years, originally sourced from Real Seeds some years ago. These are the lucky ones that have survived me, a couple of frosts and the assault of mice and slugs this year! Not much to share but maybe they will fare better with you. They are a low growing, creeping plant with fleshy leaves. They are late to tuberise, otherwise easy going and need little attention. I like the description ‘Earth Gem’ very fitting. Markfield rover, Tomatoes Sandpoint and Marianna’s Peace. Jeyes peas and Georgian runner bean. Ian Pearson, Katja tomato, Giant Prague Improved celeriac, Culinary Dandelion and *Tree Lupin. Pumpkinlover, Piri Piri chilli, May and Eastern Butterwax dwarf beans and Hannibal leek. Jayb, Gilfeather Turnip, Rocoto Orange Manzano, Beit Alpha cucumber, Violetta TPS, tomatillo Cisineros, Vermont Appaloosa DFB, Chufa nuts, Ulluco, Sweet Aperitif and Green Pear tomatoes. Sparrow, Black Futsu, Thelma Sanders and Potimarron squash, Lemon Drop chillies, Kent Blue peas. Robert B, Vivid Choy, parsnip Hollow Crown x Avon Resister. Ruud, SC2121 tomato, Ambercup squash, Turkish cucumber, Giant Fennel, Collard Yates, Trail of Tears, white seeded strain. Silverleaf, mispoona and Blue Lake CFB. Green Lily Amish Plum, Purple Ukraine [also plum], Blush Betimes Macbeth. Easyonthebrain, San Marzano, broccoli Raab/Turnip Broccoli and Minidor Yellow Dwarf French Beans. RenewableCandy, Purple Sprouting Broccoli, (RenewableCandy’s own strain) Sunflowers, Calypso CFB.